You know what one of my friends asked when she saw this? "Vampires? Again?" Then she shook her head. It's a well known fact within the small group of friends that I have a thing for vampire novels. They're my kryptonite in the literary world and no matter of power is ever going to stop that. Lucien and Meena were cute together and the addition of Jon and Alaric were most of the time well placed and helped relieve the tension of a few of the scenes. It's in limited third person so we get to see inside some of the characters head, giving us, the reader, an insightful look not only the main characters lives, but a few of the minor ones as well. 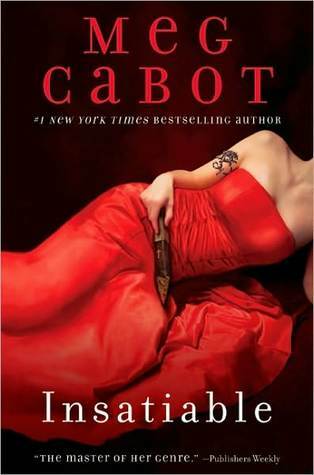 I've never read Meg Cabot before. Other than skimming through a few of her other books, this was the first one I had finished, and I must say I quite liked it. It was original, very well written, clever, and often times funny and very entertaining. However, I hated the ending and I can only hope that the second one in the series will make up for it. Lucien and Meena. They almost seem like the perfect couple. He whisks her off out of her world of television and into his world of darkness and excitement. They have their problems and their cute moments and it's easy to read through them both. Meena's Power. The fact that she can tell when people are going to die is a really clever twist to the story and totally adds to it. Meena's dog Jack Bauer. If the main heroine has a dog I think I'm genetically programmed to love it. He's so cute and is always there to protect her. Insatiable. I'd do anything to work in New York for some soap opera, no matter how terribly cheesy it is. Insatiable reminds you of those real soaps you see on TV and gives the novel a sense of reality. New York. I don't think the novel could have worked anywhere else. It feels so real and you really do get some of that New Yorker vibe from of the characters. Alaric. He just came off to me as some shallow jerk who has a prejudice against vampires and likes to kill them with his "Senor Sticky" of a sword. Jon. Meena's brother hardly seems like someone I'd want to know. He doesn't think most of the time, leeches off of his sister, and often times, only cares about his own needs. The Love Triangle. Must all romance novels have love triangles? I mean, Meena belongs with Lucien, end of story. Why did Alaric have to develop feelings for her too?! Lucien and his Pushiness. I understand that he's supposed to be the whole big shot Prince of Darkness and all that, but sometimes the way he treats others sort of bugs me. Especially with those red eyes. If you like the good old vampire romance novel with a twist, pick this up next time you see it and give it a read. Cover: 3 Stars. I'm not digging the whole stake with lady thing going on.